Forage cereals have a higher winter growth rate than most pasture options. Growth rates can vary based on the species, but generally cereals offer flexibility to any farming operation through sowing, grazing and silage or hay. Oats are a good robust dual purpose cereal for graziers around Australia that can be grazed during the winter months prior to being shut up to be cut for hay. Oats are a great source of on-farm hay production that can be sown as a monoculture or blended with other species such as Bullet Annual Ryegrass or Surge Italian ryegrass and clovers to increase yield and quality. Oats prefer If paddocks are prone to waterlogging then annual or italian ryegrasses are a better option. Ryecorn is a species of cereal that has been commonly grown on the sandy outlays of the Mallee regions of South Australia and Victoria. A versatile species that tolerates very dry conditions and grows well on sandy soil types. Performs best when grown on good fertile soils that will respond well to nitrogen applications to gain the most out of the shorter growing season. Minimum annual rainfall is 300mm p.a. Triticale is a high yielding whole-crop cereal suited to a range of growing conditions with a focus on maximising production of dry matter and conserving fodder (entire crop cut, chopped and stored via pit or wrapped silage). A cross between wheat and rye, Triticale combines the quality and yield of wheat and the versatility of rye. Cereal grazing serves two purposes; the use of green feed at a time when available feed is generally low and increasing the yield potential by encouraging more tillers and greater root growth. Increased yield potential is important given that cereals are only a short term option. The reason why cereals generally produce more feed when grazed is because the shock of the grazing forces the plant to produce secondary tillers as well as secondary roots. The more tillers produced, the higher the potential for more dry matter to be grown. Southern Green Ryecorn is an exceptionally fast establishing grazing option particularly when sown late into cold conditions. Southern Green can be up and ready to graze three weeks before oats and when managed correctly can offer multiple grazing opportunities. 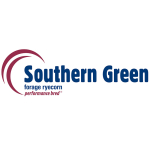 Unlike common ryecorn, Southern Green produces high quality feed at a time when feed is in short supply. 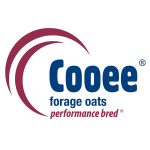 Cooee® is a versatile, fast growing, winter forage oat that provides good winter to early spring feed. One of the features of Cooee® oats is its broader style leaves that, when used in a hay production system, offer the benefits of higher quality conserved feed. Cooee® oats is adapted to a wide range of soil types and has been bred for resistance to leaf rust and good tolerance to Barley Yellow Dwarf Virus (BYDV). It is important to ensure that grazing is not too low into the crown of the plant and to allow some leaf area to be left behind which allows the plant to recover quicker. Time of grazing should cease once the day length and day time temperatures are increasing and general daily growth rates are increasing. The timing for this is late winter into very early spring, which should also coincide with the growth rates of the other pasture crops/paddocks increasing in daily dry matter production and therefore meet the increasing requirement of the livestock production system. It is also important to monitor soil moisture as this will have a large impact on the final yield potential of any hay or silage crop. A dual purpose triticale with excellent dry matter production and grain recovery after grazing. Endevour can be sown early and grazed or sown later and left ungrazed for high quality hay/silage. Resistant to leaf, stem and stripe rust. Saia Oats fast to establish and will provide good quality early winter feed if planted around late March or early April. Saia Oats, a tall fine stemmed black seeding oat, rebounds well after grazing and grows in a wide range of soil types and has a good tolerance of acid soils. Combine with annual ryegrass for winter bulk pastures.